In 1957, a new unrest raised its head in Punjab. The name of this uprising was Hindi Andolan. This revolution of sorts was waged against those who refused to give the Hindi speaking people their rights and respect in Punjab. All Hindi speaking people joined their hands and protested against their oppressors. Things took an ugly turn and an individual named Sumer Singh had to lose his life. Thus, to pay respect to the efforts of Matribhasha Satyagrahi, Haryana state authority has decided to pay all living supports with a monthly monetary grant. 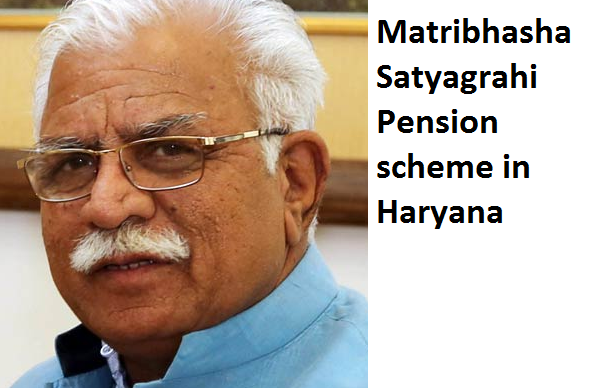 The state government of Haryana, under the leadership of the Chief Minister Manohar Lal Khattar announced that a monetary pension will be given to Matribhasha Satyagrahi who fought valiantly in Punjab. The money will be provided by the state finance department. The official announcement came in November 2017. The state will soon make arrangements to implement this scheme. Empowering the supports of Matribhasha Satyagraha – The Hindi language revolution that took place in Punjab saw the participation of many. They are in their early 60s now and thus, Haryana state government has decided to grant them a pension as recognition for their efforts. Monthly pension for supporters – Each beneficiary will be entitled to acquire a pension from the state government. This pension grant will be given to them on a monthly basis. Amount of pension per beneficiary – According to the decision of the state authority, each pension holder will be given a pension that amounts to Rs. 10,000. Number of beneficiaries – As of now, the state authority has been successful in identifying and verifying the claims of 194 supporters of Matribhasha Satyagraha. Can opt for other pension schemes as well – It has been highlighted in the draft of this scheme that if that particular pension holder is getting any other pension from the state or the central government, they will not be barred from enrolling under this scheme. But the amount of this pension will be reduced. Pension for spouse of dead satyagrahi – If any satyagrahis has passed away, then his/her spouse (wife or husband respectively) is living, the pension amount will be forwarded to them within no time. As of now, the state authority of Haryana has announced that it will take necessary measure to verify the claim of these crusaders. It is not hard to track these people down as the police records from 1957 will give their names and addresses. The verification of these mother-tongue supporters is still available from the police superintendent records. As of now, Haryana state government has already verified the existence and claims of many such crusaders. With the implementation of this pension scheme, the state government of Haryana has taken a step towards acknowledging the efforts of the crusaders who were not afraid of laying down their lives for a good cause. These supporters fought hard to earn the respect for Hindi speaking individuals who resided in the then Punjab.